Update // I expanded this post into an article for The Washington Post. Read it here! I came up with this idea when Chris and I were dating long distance a couple years ago (Phoenix >> DC). We met in person while I was visiting a girlfriend in DC and we basically started dating that day. I thought this would be a fun and interactive way to spark conversation between us, especially since talking (and Skyping) were our main modes of communication. I cut out a bunch of colored paper hearts and wrote conversation topics and things we could do from a distance on them. I folded the hearts up up and put them in an old ball jar. I sealed the jar with a bow and sent it off to him! It became a nightly ritual to unfold one while Skyping and talk about whatever was written on the heart. Soon the hearts ran out. Chris decided to keep it going and wrote conversation topics on slips of paper and sent the jar back to me! This became a tradition. Sparking meaningful conversation was very important to me and the growth of our relationship early on. We talked, texted and Skyped nonstop and although I would like to say we never ran out of things to talk about, it helped to pull out a heart and talk about a memory or a favorite song. You could gift this to a friend, significant other or family member with conversation starters written on slips of paper or notes of encouragement for when you aren't around. You can write activities, inside jokes or what you love about someone. 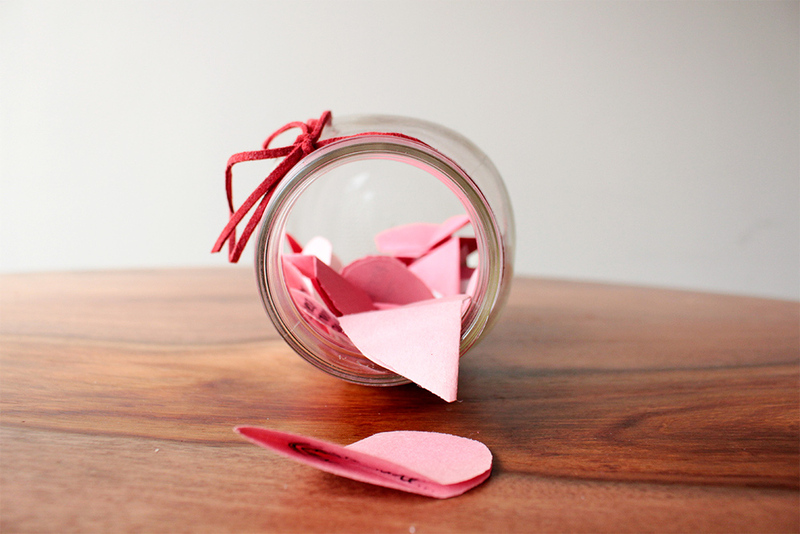 Fill the jar with notes and give to them or fill the jar together – you choose!